A private crowdfunded team will attempt to make contact with a 1970s-era NASA spacecraft this week, the first major step in an ambitious effort to repurpose the retired probe. Members of the group, which met its $125,000 crowfunding goal last week, have traveled to Puerto Rico, where they'll use the powerful Arecibo Observatory to beam messages to the International Sun-Earth Explorer 3 probe, or ISEE-3. The spacecraft launched in 1978 and ceased science operations in 1997. The extra money will be used to rent NASA's Deep Space Network scientific telecommunications system, which the team will use to stay in touch with ISEE-3 spacecraft, project leaders said. But contacting the spacecraft using the Arecibo Observatory — the world's largest single-dish radio telescope — is the first order of business. Team members are in Puerto Rico trying to make their hardware work with the telescope (which is itself several decades old) and to install a transmitter shipped from Germany this week. "Once we're certain the hardware works — that it can transmit and receive and do all the stuff to talk with the spacecraft — then the issue is getting everybody into position," said project co-leader Keith Cowing, who is remaining behind in Virginia to "pump up" the crowdfunding effort. Cowing and co-leader Dennis Wingo are receiving no funding from NASA to work with the spacecraft, but on Friday (May 16) they signed a Space Act Agreement with the agency. A private group has never contacted a spacecraft before, and Cowing said everyone wanted to be sure that things were "done right." The pact covers matters such as how the group will contact the spacecraft, what they plan to do with it and what the data will be used for. The ISEE-3 probe has had an itinerant life since entering space in 1978. It originally examined the solar wind and cosmic rays, then chased two comets (including Halley's Comet) in the mid-1980s, then was a sun probe from 1991 until 1997, when it was put into hibernation. Making contact is a challenge because there is no computer on board, requiring the team to seek out old documents to figure out how to get in touch with the spacecraft. "It doesn't even have a thermostat. It hasn’t had a [working] battery for 20 years," Cowing said. The team plans to "talk" to the probe to see which of its 13 instruments are functioning, and then to redirect its path so that it swings around the far side of the moon. 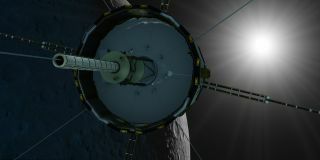 Team members will need to make sure the solar-powered ISEE-3 survives this maneuver, which will take it beyond the reach of sunlight for a spell. The group plans to redirect the probe from its current orbit around the sun to the Earth-sun Lagrange Point 1 (ES-1), a gravitationally stable spot about 930,000 miles (1.5 million kilometers) from Earth. But it's unclear what the spacecraft's ultimate fate will be; Cowing said they'll worry about that later. "It's a lot easier to have discussions with folks with a spacecraft you have saved than one you have not yet," he said. This still from a NASA animation shows the location of the International Sun-Earth Explorer 3 spacecraft relative to Earth on May 22, 2014. The ISEE-3 probe launched in 1978 and will fly near Earth in August 2014. Cowing, a former NASA employee himself, is also co-leading the Lunar Orbiter Image Recovery Project, which is digitizing original analog tapes from five robotic spacecraft that went to the moon in 1966 and 1967. He credits that effort (which he also heads with Wingo) for helping him think creatively about contacting ISEE-3. "The more we tried, the more we discovered we could do this," he said. "You could reverse-engineer stuff. You could buy parts, which were still out there. People kept this stuff in their garages." While a lot of hard work lies ahead, Cowing says he's been honored by the help and support of many former NASA workers, as well as the hundreds of people who supported the team financially. Many of those funders are not self-professed space geeks, he added, saying that perhaps NASA and other space entities should bear that in mind when doing public outreach. "When I would see them [funders] tweet something, I'd always go back and follow them from the official Twitter account. These are people with like three or four followers; they're virgin. It's astonishing. And they're saying this is so cool, what we are doing," Cowing said. "Everyone who donates now feels that they have a personal stake in our success," he added, "and that they get to celebrate when we make it work." First contact is expected this week. Updates will be available at the ISEE-3 blog at http://spacecollege.org/isee3/.